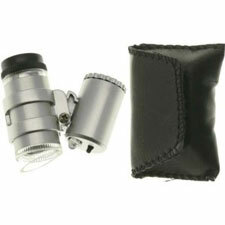 The SE Mini illuminated pocket microscope makes a useful toy or tool for the hobbyist. It's a compact, portable, low cost model that puts the microscopic world in hand anytime. At under $10, it's a lot of fun for not very much money! One nice thing about the SE Mini is that it comes with everything you need to get started exploring. It's powered by three LR927 batteries that come with the unit, and has two small LED lights that light up the specimen. If needed, it can be separated from the light source. This feature lets the user operate this illuminated pocket microscope if the batteries are dead or the sunlight is bright. It also allows you to view outside specimens in a more natural light, if that's something you want or need. The SE Mini was built to be portable, and it's certainly a small pocket model. It measures 1 7/16 by 1 3/8 by 9/16 inches, and weighs about an ounce. It also comes with a carrying case that makes it easy to slip into a pocket or purse, allowing it to share space with keys, wallets, and cell phones. This illuminated pocket microscope is pretty cheaply priced, usually found for under $10. Despite its diminutive size, it produces a clear picture for the money the user dishes out. In terms of images, the SE Mini works well to magnify specimens of interest. It reveals details in coins, stamps, and plants that are hard to see with the naked eye. The ability to tote it around makes it easy to check out items no matter where you are. Most users like the magnification power of this illuminated pocket microscope, although many don't think it ever reached the promised 45x. At the most, users report they thought it was closer to 20x or 30X. This model is made from a silver colored plastic, so the lack of metal makes it less durable. There are some reported structural issues as well, and some found that the battery cap would not stay screwed in. Apparently the lighting can be a little tricky to use for some. Certain users had to wiggle the switch in order to get it to light up. A better switch would make it a little more user-friendly. The SE Mini illuminated pocket microscope is tiny yet functional. At the price, it's hard to beat and easy to replace in case of an accident. Of course it doesn't provide the amazing features of some other more expensive pocket microscopes. Yet considering the price tag, the SE Mini is a great toy or tool. 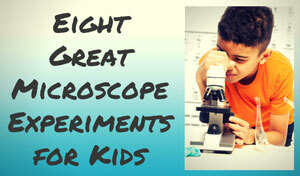 Recommended for: This model is best in the hands of young scientists and hobbyists. It can be used to get a closer glimpse of the world. However, more advanced users will want to save their money for something with more pizzazz (like the Carson Micromax). The SE Microscope 45x Illuminated Pocket Microscope is available for under $9 from Amazon.